With our items being made fresh from-scratch daily, some items may not always be readily available. We can always accommodate orders placed ahead of time with at least 48 hours notice, but for same day pick-ups, we recommend calling us to check availability. 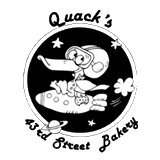 All Quacks sandwiches are provided by locally owned Fricanos Deli. All sandwiches can be served hot or cold and all come with a choice of house made salsa and corn chips or Ms. Vickies Chips and a Pickle. We use only the finest ingredients: Hand-Cracked Fresh Eggs, AA Butter, Nielsen-Massey Vanilla Extract, Unbleached/Untreated Flour, No Preservatives. LIMITED Breakfast ITEMS served between 8-12 M-F and Sat/Sun.